The girl perched on the top bunk was practically emptying a whole can of fly spray into the corner of the room while three others stood watching, their backs pressed flat against the wall. By the looks on their faces, the monster receiving the blasts must have been nothing less than a spiny-legged cockroach – like the ones that lurked around our bin in the middle of the night. Each of the girls took turns screaming instructions. I peered inside the door. A tiny brown spider about the size of a ladybird was huddled helplessly in the corner, making a feeble attempt to hold out its front legs while being drowned in torrents of Mortein Fast Knockdown. Charli is excited to be at riding camp, where she will finally learn to ride. And then, it’s just a short jump to owning her own horse. Well that’s what she hopes. But from the minute she arrives, things are not quite as she imagines. Firstly, she’s sharing a room with the snobbish Mikaela. Not her choice, but she’s already rejected the other options. Then she’s beaten to choosing the beautiful palomino and nothing, it seems, will convince Mikaela to swap. Charli is stuck with the massive retired racehorse Spud. This is not how it worked in her dreams. And as if this isn’t enough, there are bats. According to Charli’s research, bats and horses are a recipe for disaster. 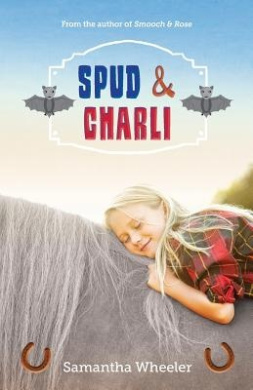 Spud and Charliis perfect for horse-loving preteens. Jam-packed with horse details from grooming to saddles, to riding terms, they’ll eat it up. Charli discovers that Spud is not as scary as he at first appears, and before too long, she is smitten. Along the way, Charli learns the difference between dreams and reality, making good and bad decisions and why it makes sense to gather all information before judging others. Despite some hasty decisions, Charli’s good sense and caring nature shines through although she has to learn some lessons the hard way. Recommended for mid-primary readers, particularly horse fans.